Investment company Investec has opened its 'Click and Investaurant' dining experience in London to celebrate the brand's new service Click & Invest. 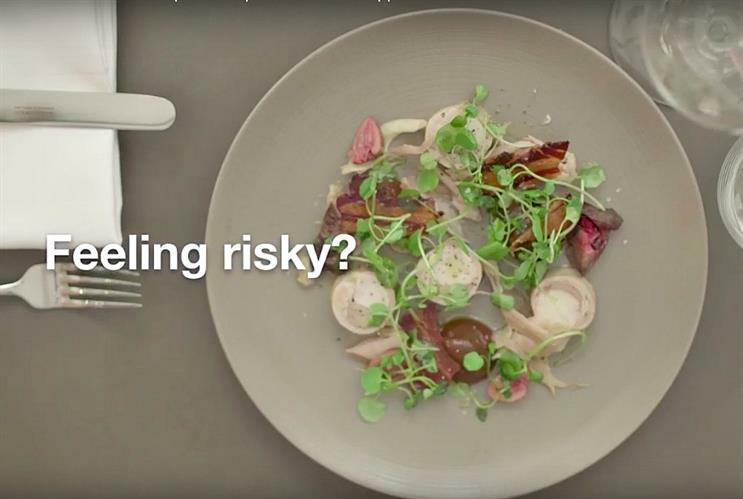 Investec's Click and Investaurant invites financially cautious Brits to reassess their perception of risk through an innovative menu selection. Guests are able to choose from five different dish options, each of which have a different level of risk. Located in Clerkenwell, London, diners will take a survey that will analyse their apetite for risk in everyday situations, and the result will determine the meal they should eat when at the restaurant. For those who are more risk-adverse, lunch will consist of burgers and chips, whereas those who are of a more adventurous nature will dine on crocodile and crispy crickets. Dishes in between the two extremes include squid ink cod, rabbit and wild nettles. Jane Warren, CEO of Click & Invest, said: "Risk is something that people encounter in their everyday lives in one guise or another and with Click & Investaurant we have been able to create an innovative concept for people to explore their appetite for risk while tasting some delicious dishes." More: Last month, Jacob's launched a one-day cracker-themed restaurant in collaboration with musician, foodie and cheesemaker Alex James. In March, Patrón brought its Secret Dining Society to London for the first European edition of its global programme.